This system costs under 100 buck and can help cool down a garden or a cookout. 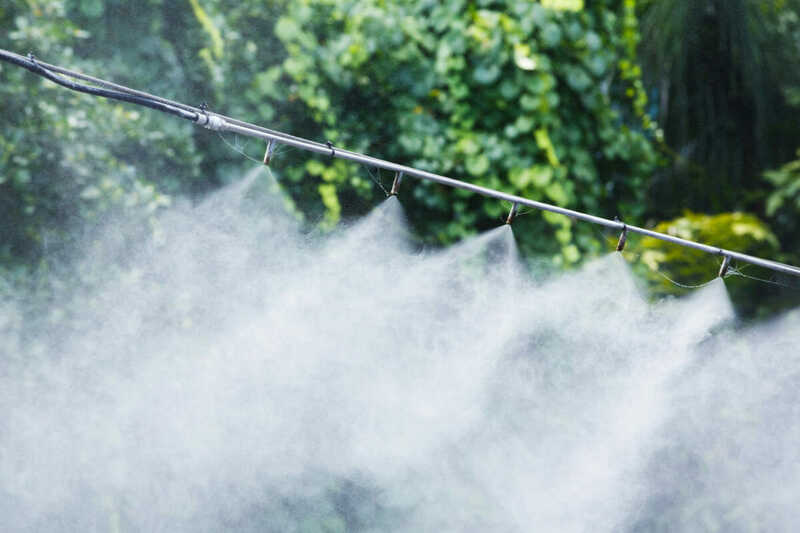 This step-by-step guide to building your own misting system can be adapted to most any space you're looking to cool off, be it a garden, a barn, or a backyard. With parts available from your local irrigation supplier or home improvement store, you can install a misting system on a deck or patio in a couple hours, all for around $50 to $100. Doing so involves little more than drip irrigation tubing and misting nozzles – small plastic or metal devices that turn water into cool clouds of moist air. It’s simple but ingenious technology, and quite sustainable; unlike cooling off in a sprinkler, misters use a miniscule amount of water. One caveat is that you need something that hangs just above head height to mount the tubing to. A pergola, gazebo, fence, edge of a roof, or even low-hanging tree branches will do. To create a cooling station for summer parties, erect a pop-up canopy tent and mount the tubing to the frame. It’s simple, ingenious and sustainable: unlike a sprinkler, misters use a miniscule amount of water. The drip tubing adapter will have an open un-threaded end. Push one end of the plastic tubing into this end, wiggling it back and forth a bit so it slides in an inch or so. This is known as a compression fitting, as the tight fit forms a seal, preventing leaks. Run the flexible plastic tubing from the spigot to the location where you want to create mist. You can use “elbow” compression fittings and “T” compression fittings as needed to route the tubing to where you want it. Use tubing stakes to secure it to the ground every few feet; cable ties to secure it to tree limbs or the metal frame of a canopy tent; and ½-inch nail straps to secure it decks, pergolas, walls and other structures. Seal off the open end (or ends) of the tubing with figure-eight end clamps. Note: the shorter the tubing, the higher the water pressure at each misting nozzle, resulting in a finer mist. It’s important to use only those intended for low-pressure misting systems (medium- and high-pressure systems require an expensive pump). Make sure to purchase nozzles intended for ½-inch tubing – these typically have a 1/8-inch threaded of barbed connector. Plastic nozzles are cheaper, while brass nozzles last longer. The smaller the diameter of the nozzle, the finer the mist; and the finer the mist, the more it evaporates into the air, rather than condensing and falling to the ground. This is an important consideration in situations where you want mist, but you don’t want everything in the vicinity to get wet – at parties, for example, where there are tables of food and people are dressed in fancy clothing; or in livestock areas, where you don’t want to saturate the animals’ bedding. In other situations, like in a greenhouse or next to a pool, a bit of wetness usually isn’t an issue. If you find things are getting too wet for your liking, you can always turn off the system for a bit – the summer heat will dry things out in a jiffy. Most low-pressure misting nozzles produce droplets around 100 microns in size. “Superfine” low-pressure nozzles, with droplets down to 50 microns, are available from specialty suppliers, however. One other consideration: anti-drip devices. Misting nozzles tend to drip for a while after you shut the water off, which may be undesirable in certain contexts. To prevent this, look for nozzles with a built-in anti-drip device. This is the easy part. Simply punch holes in the tubing every two to three feet (using a drip tubing punch tool) in the area where mist is desired. Push the nozzles into the holes until you feel a slight “snap” (or screw them in if using threaded nozzles). Turn on the water full blast, kick back, and cool off. Hi my name is Vanessa and I am working on a project in which I would like to use a misting system that doesn’t involve water but a different liquid. Would you happen to know if that is possible?